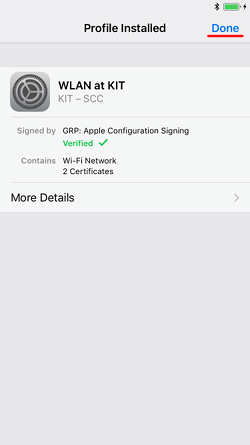 There are two ways to set up WLAN on iOS: configuration profiles or manual configuration. We recommend using configuration profiles as they provide additional security features. 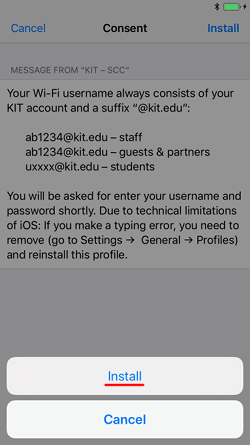 If you already installed an eduroam profile provided by another institute, make sure to uninstall it beforehand (go to Settings → General → Profiles). Only install profiles marked as “Verified ✔”. 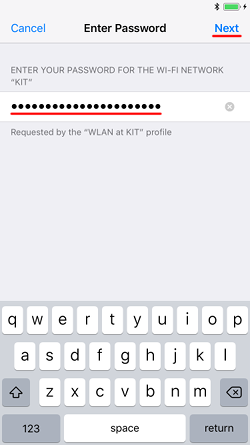 If you make a typing error when entering your WLAN username, you need to remove (go to Settings → General → Profiles) and reinstall this profile. 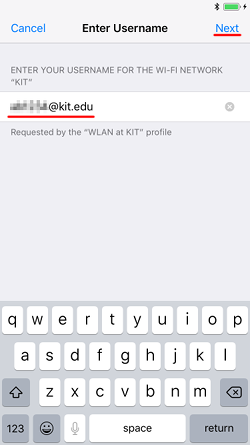 Open the "Settings" out of your home screen [figure 1], press "Wi-Fi" [figure 2] and enable it. You see all visible wireless networks in your area [figure 3]. Choose the network KIT by pressing on it. 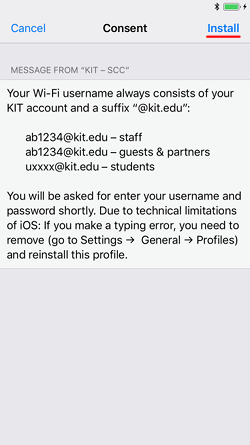 Log in with your KIT account (e.g. ab1234Lhl2∂kit edu or uxxxxMwl7∂kit edu) and press "Join" (in the upper right corner) [figure 4]. Accept the certificate from our authentication server (radius-wlan.scc.kit.edu), which has to be issued by KIT-CA, by pressing on "Trust" [figure 5]. If the certificate is not issued by KIT-CA, please contact the Service Desk. 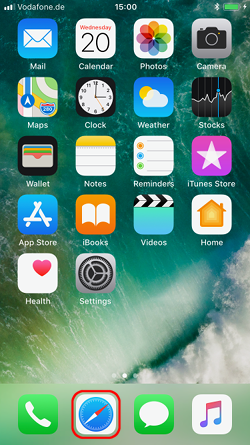 Now you see a Wi-Fi icon next to your service provider [figure 6].